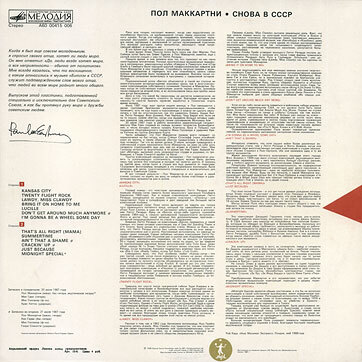 Anyone vaguely familiar with the vinyl editions of Paul McCartney’s 1988 release Снова в СССР on the Russian Melodiya label will know that there are two different versions. The two additional tracks are “I’m Gonna Be A Wheel Someday” (track # 7, the last on side 1), and “Summertime” (track # 2 on side 2). Why this is so has never been fully explained – until now. I bought the record of Paul McCartney’s Снова в СССР. After a while I saw it again on a shop counter and could not resist of buying it again. For good reason! It turned out that there are 11 songs on the first record, released on September 14, 1988, and the second one which was released on January 1, 1989, carried 13 songs. What a mystery! – First of all I want to say that your reader is lucky. Why? Just how you will soon understand for yourself. According to the contract, this licensed disk should have consisted of 13 songs, and a special contract clause stipulated that the artist’s desires would be accepted in the design of the sleeve. However, «Mezhdunarodnaya kniga» (our intermediator) provided us with a tape with eleven songs. The recording fit with the Soviet State Standard in terms of running time and so we began working with it. According to the requirements of the contract, a test record and sleeve were sent to Mr McCartney. He studied them and made a few remarks. Although Leningrad Plant had already started pressing and distributing copies, we could not ignore these remarks. Corrections were therefore made to the design, the initial sleeve notes were replaced, and besides this we were sent the recordings of two more songs to include. For this reason the extended record plays longer than any domestic discs [i.e. 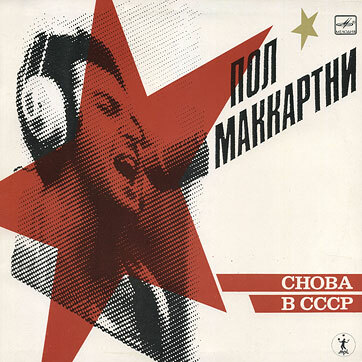 Melodiya in its working history had never released any LP playing longer than the 13-track McCartney СНОВА В СССР]. And so two records with the same title appeared. By the way, the first record because of its “shamefulness” appearance and limited edition, became a rarity desirable for record collectors, especially abroad since it was intended for sale only in our country. As far as we know, in the USA and Europe 200-250 dollars were paid for this record. So the reader of «Sovetskaya kultura» became the owner of discophile rarity. So, a little bit more information on the mystery as to how two different records (with the same catalogue number) came into existence. For a full explanation of all the variations between the two editions and more see the excellent Russian site beatlesvinyl.com.ua. 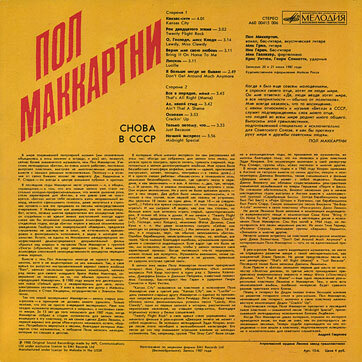 It contains intricate detail of every Russian Beatle release. For the 11 track, first edition version of Снова в СССР click here. For the 13 track second edition versions click here. This entry was posted in Beatles, Beatles Music, Paul McCartney and tagged Beatles, Beatles Collecting, Choba B CCCP, Music, Paul McCartney, vinyl by beatlesblogger. Bookmark the permalink.